MFT February Release Countdown Day 2! Are you all getting those list for shopping the latest release ready, so many wonderful products this month..
Today we are at Day 2 and today I am sharing a card created using Birthday Bear and Friends.. I stamped out the images that I wished to use, coloured them up with Copics and die cut out.. I then worked on my background, cutting a piece of white card stock to be a square and adding heavy colours of Berrylicious, Ripe Raspberry, Lemon Drop and Wild Wisteria, I flicked some water over the top and once that was dry, I added Sweet Tooth Pigment ink over the Card Size Confetti Stencil.. 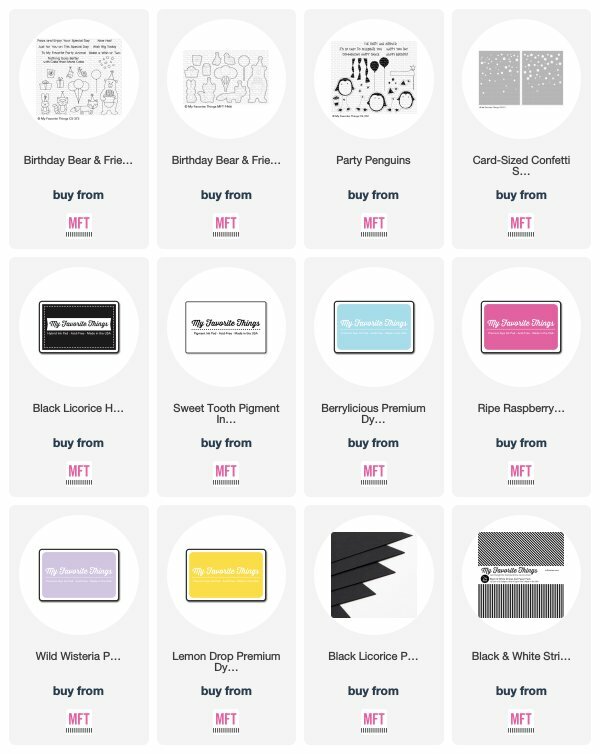 I then cut a strip of Black Licorice card stock and embossed a sentiment from the Party Penguins, adding this to the base as well as a piece of pattern paper from the Black and White Stripes..
Lastly, I added my images and my card was complete.. Remember to swing past the blog to see all the creations for today..